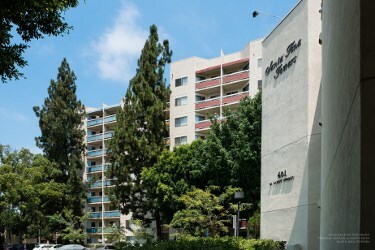 Santa Ana Towers is a 200-unit, Section 8/Tax Credit property for people 62 and over. The waiting list is currently closed. Located within walking distance to downtown Santa Ana, the property provides easy access to transportation, community services, shopping, and a local senior center. The units are one bedroom and include a kitchen equipped with a range and oven, refrigerator, and waste disposal, air-conditioning, wall-to-wall carpeting, vinyl flooring, window blinds, a patio or balcony, smoke detectors, fire sprinklers, and a controlled access intercom entry system. The property features a spacious community room, exercise room, billiard room, laundry facilities and a garden area. Regularly scheduled activities include weekly bingo, crochet, crafts, monthly parties, casino trips, seminars, dances and other group activities.